Before he became the best-selling author of the Inspector Rebus novels, Ian Rankin spent three years researching a PhD on one of the Scotland's other great novelists, Dame Muriel Spark. Rankin told BBC Scotland Spark was an "extraordinary" writer who was loved by aficionados but was not lauded in her homeland as much as she should be. He was speaking as The National Library of Scotland began an exhibition looking at Spark's life and work. The exhibition, part of the celebrations marking 100 years since her birth, draws on the extensive archive of her writing and letters she donated to the library, as well as personal items such as handbags, clothes, her typewriter and rosary beads. Rankin, whose own burgeoning writing career meant he never finished his University of Edinburgh doctorate, said he only met Spark once. She died in 2006 at the age of 88 but a couple of years before that Rankin saw her at the Edinburgh Book Festival. He said: "I watched her being interviewed and reading from Miss Jean Brodie, including the famous mention of the Creme de la Creme. "There was a frisson that ran through the audience because it was the one bit everybody wanted her to read from." The Prime of Miss Jean Brodie, probably Spark's most famous novel, was published in 1961 and eight years later Maggie Smith won an Oscar for playing the lead role in the film adaptation. The novel was set in Edinburgh and inspired by Spark's time at James Gillespie's School for Girls in the 1930s. Although she grew up in the city, she left at the age of just 19 when she met and married Sydney Oswald Spark. The couple moved to Southern Rhodesia (now Zimbabwe) but their marriage ended soon after the birth of her son Robin. Towards the end of World War Two she returned to Britain without her son and, among other things, worked for British intelligence. She began writing prose and poetry while living in London after the war but her first novel was not published until 1957 when she almost 40. 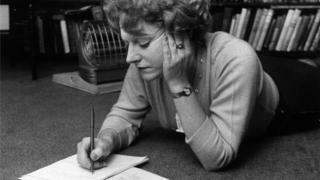 Miss Jean Brodie was a breakthrough work that led to a varied career spanning five decades. Rankin said it was a copy of this novel he got Spark to sign when he met her in 2004. He said: "Her books are like a Tardis, they are much bigger on the inside than they are on the outside. "A book like Miss Jean Brodie is 100 pages. It's a tiny book and yet it contains multitudes. "It contains comedy and tragedy and farce, it's got extraordinary characters, complex moral dilemmas - all kinds of things. "It is a fantastic book about Edinburgh and a fantastic book about growing up." Rankin said all Spark's novels were like that, "books that could be read and re-read and you would continue to get information from them". According to Rankin, Spark, who was made a Dame in 1993, was an "experimental writer". "I don't think she was a natural novelist," he said. "She always thought of herself as a poet. "If you go to her grave it actually says 'Poeta' on it, it does not say novelist." He said she was not blinkered or inward looking, with her books being set in places such as America, Italy and Jerusalem. "You never knew what you were going to get," said Rankin. "It was like a lucky bag." Spark lived with her close friend Penelope Jardine in Tuscany from the early 1970s until her death. She famously refused to throw out any of her personal papers and the archive has been acquired by the National Library of Scotland. Rankin said aficionados loved Spark and during her life she was lauded by some of the greatest literary figures around. So why is she not better known and celebrated? "It could be that she did not have that one character like Rebus that she wrote about for 30 years," Rankin said. "Maybe it was harder to keep an audience because people were not going to get the same character or the same setting again and again. "Also Scotland has been bad in the past at recognising writers and artists who leave. "There is the Scott monument but not the Robert Louis Stevenson monument. Scott stayed and Stevenson left. Muriel Spark left. "Many writers have had to leave to find themselves, to get a sense of themselves and to find their true vocation as a writer. "Of course, she did not set many of her books in Scotland. They are very Scottish novels but you have to dig below the surface of them to find her Scottishness."